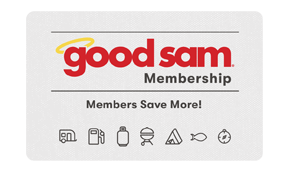 *Free camping is a rebate certificate redeemable up to $25 of your Good Sam Park stay. Offer is not retroactive. Offer not transferable and cannot be combined with any other offer. Campground prices subject to change. Certificate will be delivered in your membership kit. Please allow 2 weeks for delivery.